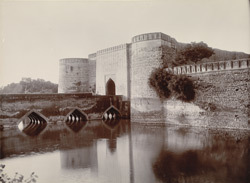 Photograph from the Curzon Collection, of the Ramji Darwaza, the south entrance to the citadel at Bharatpur in Rajasthan, taken by the studio of Priyalall & Company in c.1900. Bharatpur became the capital of Bharatpur State in 1733 when the Jat Maharaja Suraj Mal (ruled 1733-63) captured the fort at Bharatpur from a rival Jat chief. The Lohagarh or Iron Fort, a citadel that stands in the north-west corner of the walled city, was built in 1733 by Suraj Mal on the site of the earlier, smaller mud fort. It originally had massive double ramparts surrounded by a deep, wide moat. This view of the south entrance shows a bridge over the moat leading to an imposing portal set between bastions. Paintings of war elephants can be faintly seen on the stone façade either side of the central pointed arch.